She was in the care of social services and was staying at a Winnipeg hotel when she disappeared. 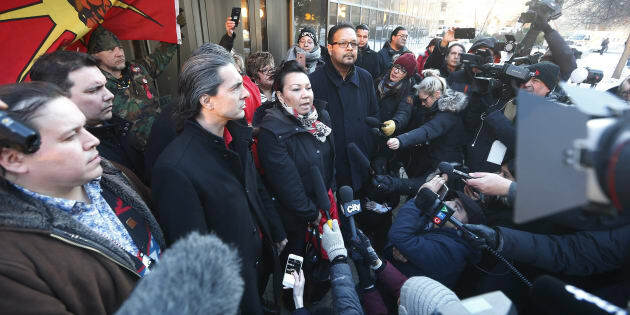 From left, Grand Chief Jerry Daniels, Southern Chiefs' Organization, Chief Arlen Dumas, Chief Sheila North, and Chief Kevin Hart speak to media outside the law courts in Winnipeg after the jury delivered a not-guilty verdict in the second degree murder trial of Raymond Cormier, Thursday. WINNIPEG — Supporters of Tina Fontaine plan to hold a walk in Winnipeg today to honour the girl a day after the man accused of killing her was found not guilty. "The CFS (Children and Family Services) system has definitely failed Tina Fontaine, the Winnipeg Police Services failed Tina Fontaine and Canadian society failed Tina Fontaine," said Kevin Hart, the Assembly of First Nations regional chief for Manitoba. "Everybody right now across this country should be ashamed of themselves for the injustice that just occurred here." Tina's body, wrapped in a duvet cover and weighed down with rocks, was pulled from the Red River in Winnipeg eight days after she was reported missing in August 2014. Cormier was charged more than a year later. The jury heard how Tina's relatively stable upbringing spiralled out of control when her father was murdered. Her mother came back into her life and Tina had gone to visit her in Winnipeg, where the girl descended into life on the streets. Fontaine was in the care of social services and was staying at a Winnipeg hotel when she disappeared. Thelma Favel, centre, Tina Fontaine's great-aunt and the woman who raised her, weeps as she enters the law courts in Winnipeg with Chief Kevin Hart and supporters the day the jury delivered a not-guilty verdict in the second degree murder trial of Raymond Cormier, Feb. 22, 2018. She said Fontaine's death galvanized Canadians to demand measures to stop the ongoing tragedy of missing and murdered Indigenous women and girls. "The families of these women and girls - and the whole country - need answers to the systemic and institutional failures that lead to the murder of Tina Fontaine and far too many other Indigenous daughters, mothers, sisters, aunties, and friends," Bennett said. "We need to examine all the factors that lead to these violence acts, including: policing, child welfare, health care, and the social and economic conditions." Sheila North, grand chief of Manitoba Keewatinowi Okimakanak, an organization that represents northern Manitoba First Nations, said everyone involved in Tina's life failed her. "We as a nation need to do better for our young people. All of us," said Sheila North, grand chief of Manitoba Keewatinowi Okimakanak, an organization that represents northern Manitoba First Nations. "All of us should be ashamed."